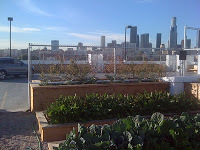 Los Angeles has sprouted a very cool rooftop garden. Here where January temperatures are often in the 70’s, buildings aren’t designed to hold snow, meaning that our roofs usually can’t hold much weight. So rooftop gardens are rare. But on the border of Little Tokyo, skid row, and a warehouse district, an old seafood warehouse rooftop has been turned into a gourmet garden atop the home of artisan food purveyor Cube Marketplace. Full disclosure: I’m the lucky gardener. And this weekend I’ll be teaching a Fall Gardening Class and a class on new ways to use common garden herbs. For more information or to sign up for the classes click here. The classes are part of a quarterly pop-up marketplace. Even if you don’t want to take the classes, this is an opportunity to come and check out the garden. 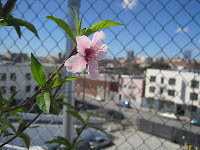 I love watching the bees pollinate the flowers and then looking out at the view of Downtown Los Angeles and the industrial sprawl down below. It is delightfully incongruous. As long as we are asking our readers for ideas, I have a few projects I could use your help on as well. 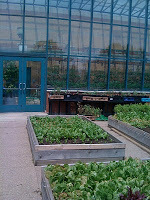 I am looking for an edible rooftop garden to visit. Ideally it would be in Southern California, but I may also visit Austin, Texas. So either L.A. or Austin gardens would work. I’d love to hear from anyone who knows of a great rooftop edible garden, but I’d really like to find ones that I can visit. 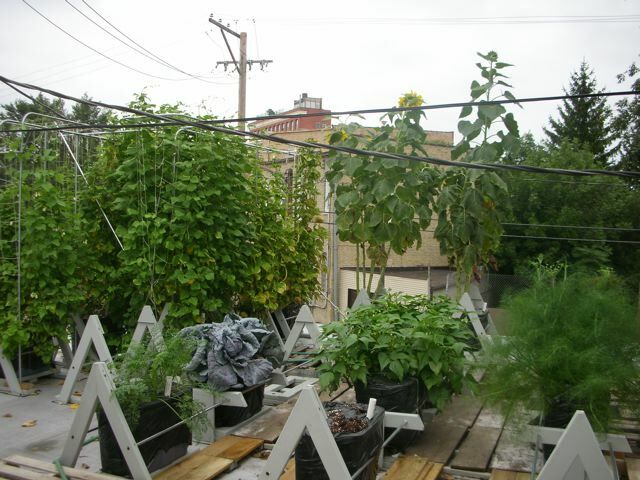 The picture here is of an urban farm in Chicago that I visited this summer. It isn’t on a roof, but it is smack dab in the middle of the city and was pretty impressive. And since I may be visiting Austin, I’d like to know of any cool projects or people I should visit there. Anyone who brews beer, builds bikes, does some serious composting, is an urban farmer or raises chickens would be great. And I’d love to see some community gardens. So Texas, I want to hear from you. Leave a comment or email me at [email protected]. More on that nice rooftop garden . . . Thanks Bruce F! And we’ll be back soon after we recover from our weekend trip to the emergency room (kidney stones–ouch!). Holy Crap! What a Nice Rooftop Garden! 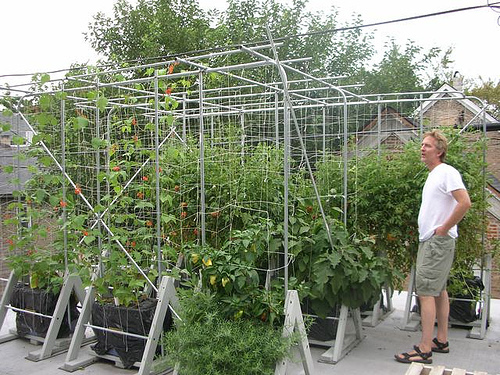 Check out how these enterprising Chicagoans responded to the “but I don’t have room for a garden” argument via antifa173’s informative rooftop gardening Flickr set. Not only do you get to see their beautifully designed self-watering container system, but they tell you how to do it with detailed instructions!